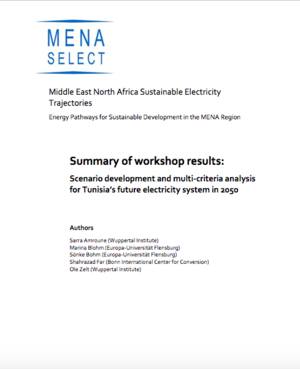 Summary of workshop results: Scenario development and multi-criteria analysis for Tunisia’s future electricity system in 2050. Please find the project page here. Within the framework of the research project MiddleEast North Africa Sustainable Electricity Trajectories (MENASELECT), a two-day workshop was conducted in the Hotel Africa in Tunis, Tunisia on 19 and 20 October 2017. Stakeholder representatives from different national societal groups related to energy issues were invited to discuss and develop future scenarios of Tunisia’s power supply with the help of an advanced spreadsheet model, followed by an evaluation of the developed scenarios. In this Paper, the results of the workshop are summarized. The objective of the workshop is two-fold. In the first part of the workshop, the participants were introduced to the modelling approach. Central input parameters, procedures and assumptions were presented. This formed the basis for the subsequent development of scenarios for Tunisia’s electricity system in 2050. Using the spreadsheet model, the participants developed fourconsistent scenarios (Mix; Mix+Solar; 5GW Mix; Solar+Gas), featuring a wide range of renewable energy shares from approximately 27 to 100 per cent of the future national electricity production. In the second part of the workshop, the participants ranked the developed scenarios according to their preferences. For this purpose, they conducted a multi-criteria analysis, which included quantitative and qualitative criteria for fossil- and renewables-based energy technologies. Representing the position of their respective institutions, the participants weighted the selected criteria against each other and ranked the four electricity scenarios mentioned above in combination with the criteria performance for each technology. The calculated ranking showed that the Tunisian stakeholder representatives much preferred a scenario with a share of 100per centrenewables in 2050over any other scenario.In taking into accounttechnical, economic, environmental and social parameters, the participants of the workshop successfully developedwidely accepted options forTunisia’sfuture power supply.